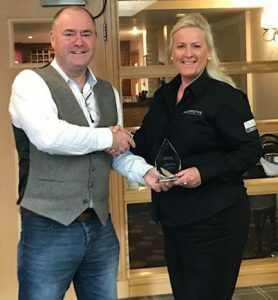 The award is presented by Tony Bowler, owner and founder of The Business Culture Hull, to the member he feels is making the most out of their membership. Directive Training Director Melisa said “I had absolutely no idea that I was going to receive this award and was so surprised when my name was called out at the packed event on the Pride of Hull (Rotterdam!) as I am relatively new to Business Culture Hull. Since becoming a member I have found that I have been able to see networking in a different light to its typical approach. Having regular 1-1’s with Tony has enabled him to learn much more about my business. He is helping me connect with other members within tBC Hull with who there is mutual benefit to building and growing business relationships. The approach is so much more relaxed than the usual formal setting. Business Culture Hull host monthly events which enables members to meet on a regular basis. I plan to attend as many of these as possible as it does help members to develop their relationships further and understand more about their business. It also enables members to provide support to each other. I am really enjoying being part of Business Culture Hull and I feel that the support from The Business Culture and its members will be instrumental in what Directive Training hope to achieve”. Melisa is a certified Microsoft trainer with over 25 years’ experience in training within the public and private sectors. Melisa is recognised for her ability to build and maintain strong customer relationships in order to develop solutions and provide opportunities for continuous staff development and improvement. She designs and delivers a complex range of solutions including IT and bespoke curriculums. Directive Training is a small, dynamic, forward thinking, leading provider of training and skills. Directive is owned and run by a team of very experienced and professional IT trainers. We are focused on helping your organisation meet its business goals through improved staff performance. We apply and share our knowledge, experience and stories, to a wide range of training courses. Courses and workshops are developed to provide the very best theory-led training, underpinned by practical knowledge, to support all learners in attaining an immediate and lasting impact on their performance. All of our training and development offerings are propelled by the customer and tailored around your specific requirements. For many courses we provide a training needs analysis. From entry level courses that help to develop core skill sets, to advanced courses made to suit specific training needs, we use experienced trainers and tutors who are experts within their subject areas. Courses include Microsoft Office and Apple productivity workshops, Adobe Illustrator and Photoshop, Business Skills& Communications, Train the Trainer, Functional Skills, Adult Apprenticeships in the Digital sector. All courses are followed up with a workshop session to answer those questions that crop up when learning is applied. For more information of Directive Training courses and services check out our website.